The “right to erasure” by the removal of personal data from an organization’s customer data is a key protection in the European Union (EU) General Data Protection Regulation (GDPR). Removing personal data includes removing system-generated logs but not audit log information. PowerApps allows users to build line-of-business applications that are a critical part of your organization’s day-to-day operations. When a user leaves your organization, you'll need to manually review and determine whether to delete certain data and resources that the user created. Other personal data will be automatically deleted whenever the user’s account is deleted from Azure Active Directory. ** Each of these resources contains “Created By” and “Modified By” records that include personal data. For security reasons, these records will be retained until the resource is deleted. *** For environments that include a Common Data Service database, environment permissions (that is, which users are assigned to the Environment Maker and Admin roles) are stored as records in that database. For guidance on how to respond to DSRs for users of Common Data Service, see Responding to Data Subject Rights (DSR) requests for Common Data Service customer data. PowerShell access: PowerApps cmdlets for app creators and administrators and cmdlets for on-premises gateways. ** With the introduction of Common Data Service, if a database is created within the environment, environment permissions and model-driven app permissions are stored as records within the instance of that database. For guidance on how to respond to DSRs for users of Common Data Service, see Responding to Data Subject Rights (DSR) requests for Common Data Service customer data. Any user with a valid PowerApps license can perform the user operations outlined in this document using the PowerApps or PowerShell cmdlets for app creators. If you are a member of an unmanaged tenant, meaning that your Azure AD tenant does not have global administrator, then you will still be able to follow the steps outlined in this art to remove your own personal data. However, since there is no global administrator for your tenant you will need to follow the instructions outlined in Step 11: Delete the user from Azure Active Directory below to delete your own account from the tenant. If you are a member of an unmanaged tenant then you will see an "IsViral": true in the response. Otherwise, you belong to a managed tenant. If you determine that the environment is not being used by anyone else in your organization, you can choose to delete the environment. If you determine that the environment is still required, you can choose not to delete the environment and add yourself (or another user in your organization) as an Environment Admin. Deleting an environment will permanently delete all resources within the environment, including all apps, flows, connections, etc. So please review the contents of an environment before deletion. From the PowerApps Admin center, select each environment in your organization. If the environment was created by the user from the DSR request, select Security, and proceed with the steps outlined in Administer environments to give admin privileges to yourself or another user in your organization. This function works only in environments that do not have an instance of a database in Common Data Service. Users can be assigned permissions (such as Environment Admin and Environment Maker) in an environment, which are stored in the PowerApps service as a “role assignment.” With the introduction of Common Data Service, if a database is created within the environment, these “role assignments” are stored as records within the instance of that database. For more information, see Administer environments. You must be an Office 365 Global Administrator or Azure Active Directory Global Administrator to be able to review all environments that have been created within your organization. If your environment does not have a Common Data Service database, you will see a section for Environment Roles. Within Environment Roles, select both Environment Admin and Environment Maker separately and, using the search bar, search for the user’s name. If the user has access to either role, from within the Users screen, remove their permission, and select Save. This function works only for environments that do not have an instance of a Common Data Service database. A user can delete an app from the PowerApps site. For the full steps on how to delete an app, please see deleting an app. You must be a Office 365 Global Administrator or Azure Active Directory Global Administrator to be able to review all environments that have been created within your organization. Whenever an app is shared with a user, PowerApps stores a record called a “role assignment” that describes the user’s permissions (CanEdit or CanUse) to the application. For more information, see the Share an app article. An app’s role assignments will be deleted when the app is deleted. The app owner's role assignment can only be deleted by assigning a new owner for the app. For each environment select Resources > Apps. If the user has access to the app, from within the app’s Share screen, remove their permission and select Save. Connections are used in conjunction with connectors when establishing connectivity with other APIs and SaaS systems. Connections do include references to the user who created them and, as a result, can be deleted to remove any references to the user. Owner role assignments cannot be deleted without deleting the connection resource. Custom Connectors supplement the existing out of box connectors and allow for connectivity to other APIs, SaaS and custom-developed systems. You may want to transfer Custom Connector ownership to other users in the organization or delete the Custom Connector. 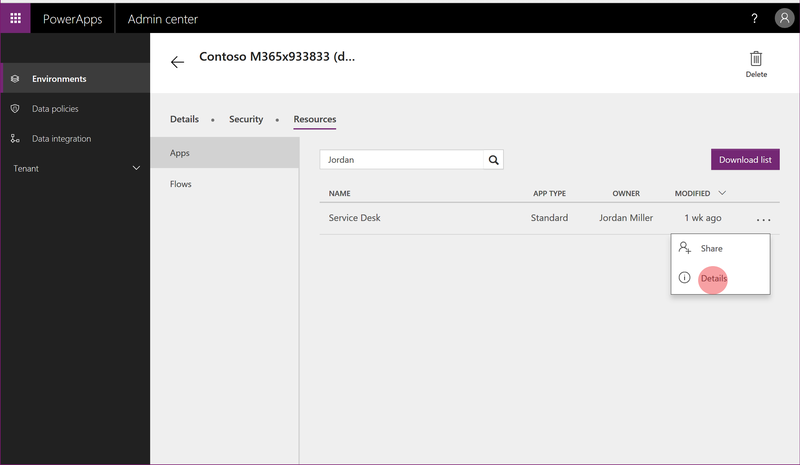 PowerApps licenses always include Microsoft Flow capabilities. In addition to being included in PowerApps licenses, Microsoft Flow is also available as a standalone service. For guidance on how to respond to DSRs for users who use the Microsoft Flow service, see Responding to GDPR Data Subject Requests for Microsoft Flow. It is recommended that admins complete this step for a PowerApps user. 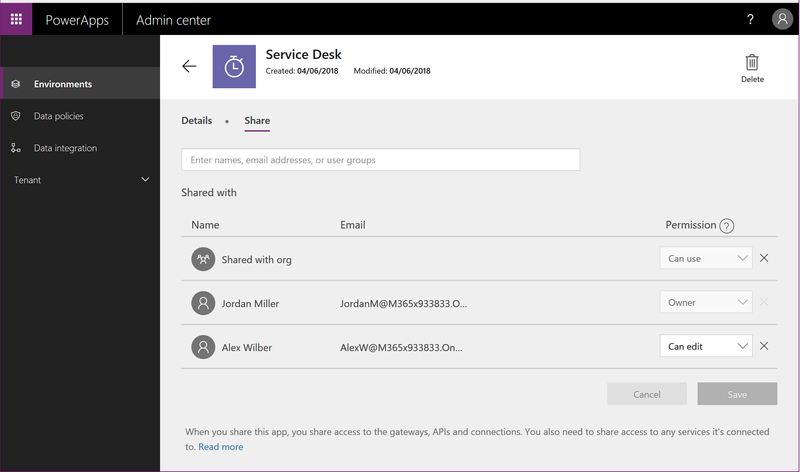 Certain PowerApps licenses, including the PowerApps Community Plan, give the ability for users within your organization to create instances of Common Data Service and to create and build apps on Common Data Service. The PowerApps Community Plan is a free license that allows users to try out Common Data Service in an individual environment. See the PowerApps pricing page for which capabilities are included in each PowerApps license. For guidance on how to respond to DSRs for users who use Common Data Service, see Responding to Data Subject Rights (DSR) requests for Common Data Service customer data. Once the above steps have been complete the final step is to delete the user’s account for Azure Active Directory. 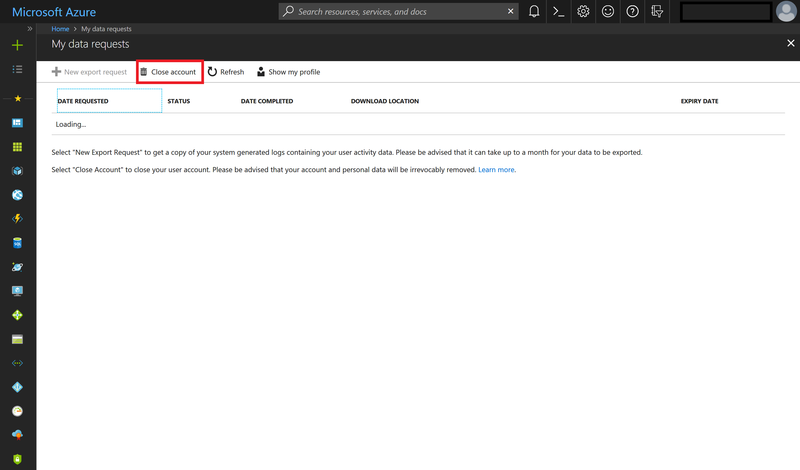 As an admin of a managed Azure AD tenant you can delete the user's account by following the steps outlined in the Azure Data Subject Request GDPR documentation that can be found on the Office 365 Service Trust Portal. Please see the Unmanaged tenant section above to see how to detect if you are a member of an unmanaged or managed tenant. Navigate to the Work and School privacy page and sign-in with your Azure AD account. Select Close account and follow the instructions to delete your account from your Azure AD tenant.